Event Espresso 3.1.30 is out! Here’s what’s new. A new version of Event Espresso is available, packed with fixes and some new features to make your event management a smoother and faster process. As always with our minor point releases, the focus of Event Espresso 3.1.30 was bugfixes, and the biggest of those was the Jetpack compatibility fixes. If you are a Jetpack user and you’ve had to deactivate Jetpack or downgrade to an older version, you’re in luck. This version of Event Espresso has been tested to work with the latest Jetpack. Another issue that might have affected some of our Dutch users who are using the iDeal gateway was the conflict with the WooCommerce iDeal gateway. That’s been resolved as well, along with a number of other important updates to the rest of the payment gateways. We also removed some of our old, hard-to-support legacy gateways. The reason these were removed was because those gateways do not provide developer accounts — so we couldn’t test them — and we don’t have a lot of users using those gateways. Instead of trying to invest the time in updating them blindly, without knowing if they actually work or not, we’ve put them up in a public GitHub repository. Anyone interested in taking over updating these gateways, can fork them or submit pull requests. Speaking of GitHub, did I mention that our language files are there now? 3.1.30 introduces the new language “side-load” feature, removing the languages from the core plugin (for a smaller package size) and hosting them on GitHub, automatically downloading them to your site if you are using WordPress in another language. Additionally, .30 introduces the ability to upload your modified language files to /wp-content/uploads/espresso/languages. We made a modification to the Multi Event Registration cart registration process for events that did not have group registrations active. Previously, those events would display a radio button, but that didn’t always send the number of attendees and a radio button, with no other options, isn’t exactly the best use of a radio button semantically. We’ve replaced this with a dropdown, which makes more sense and actually sends a value every time. 3.1.30 also adds a number of security fixes and updates. We did add some new stuff, too. The EVENT_LIST shortcode now supports multiple categories in one event list. A new System Status page gives you an overview of your server information and what plugins you have active. And we’ve added support for using hooks in WordPress themes for your Event Espresso registration pages to provide more customization options. 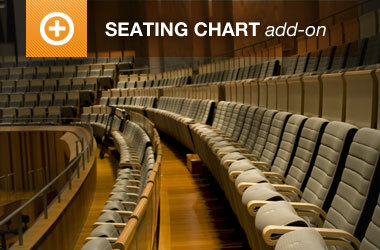 This release also is required for the new version of the Seating Chart alpha. A number of fixes were made to the Seating Chart to fix things like mis-aligned rows, section alignments, and registration prices. So go update Event Espresso now, or download the latest version in your account area. If you have any questions or problems be sure to let us know in the support forums. 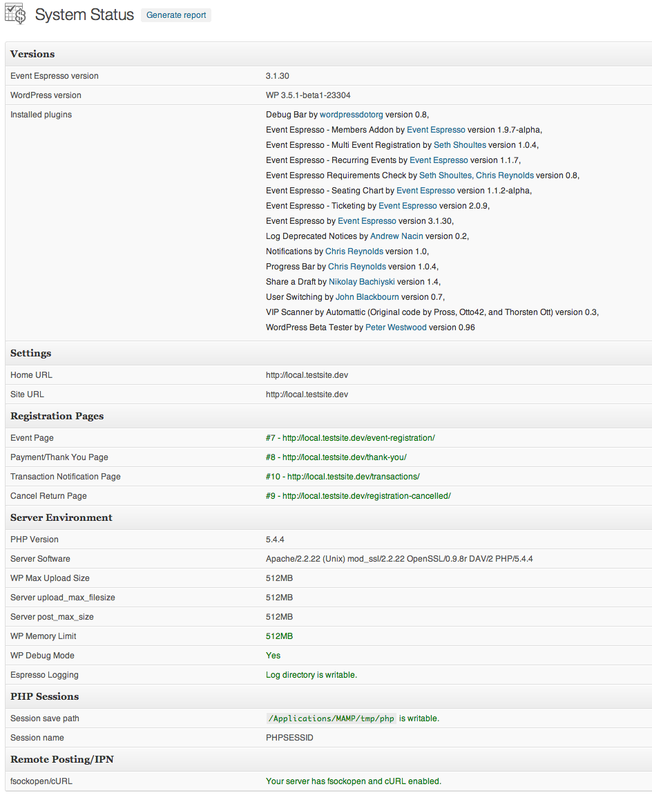 Please note: WordPress 3.5 is required for the latest version of Event Espresso. Please upgrade WordPress before updating to the latest version of Event Espresso. Where do I install the seating chart? I will not be able to attend this hangout, but will pose my question for anyone who can answer it. Eventbrite is the leader for generic events of all types but they do not list nowhere near to half of what is going on. Would this be possible with eventespresso. also, as social is so important, adding a layer of this for people to converse about the event would be awesome. I look frwd to your thoughts. Would this be possible with eventespresso. also, as social is so important, adding a layer of this for people to converse about the event would be awesome. This may come eventually. A great plugin that adds this social layer is BuddyPress, and we’ve done some investigating in integrating with BuddyPress, but we really need to partner with a developer who knows BuddyPress really well to be able to integrate really deeply with BuddyPress. As it stands now, you can use Event Espresso with BuddyPress, but there is no inherent integration between the two. Is there any chance you will add more functionality to the Mail Chimp plugin? I would like to be able to add people to certain groups on my list. Just adding them to the list without that is not useful to someone serious about email marketing. Thank you for your question and we agree. Group functionality is being worked on right now We hope to have an update with that in the next two months (after final development testing, then about 30 days of internal testing by support). IT will then be released as a Beta (for public testing) for 30 days and then released as a “stable” version. This is excellent news! I expected this functionality when I purchased and I’m really glad you are working on it. This will take EE to the next level for me.